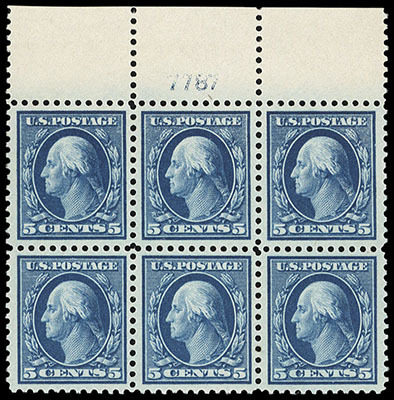 1917, 5¢ blue, top margin plate "7787" block of 6, bottom right pair lightly hinged, others never hinged, exceptional centering on bright paper, deep color, Extremely Fine. 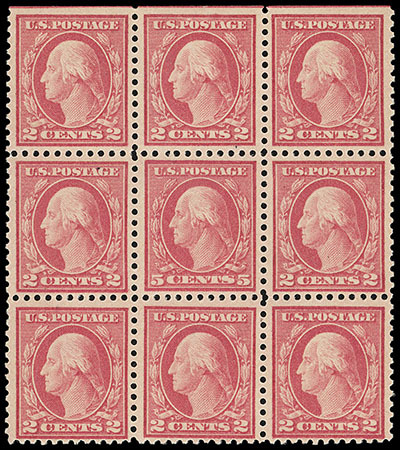 1917, 5¢ rose error, the single error in a block of 9, o.g., never hinged, strong bright color, F.-V.F. ; with 1993 P.F. certificate. 1917, 5¢ rose error, the double error in a left margin block of 24, o.g., top error lightly hinged, other never hinged, nicely centered amid wide margins, Very Fine. 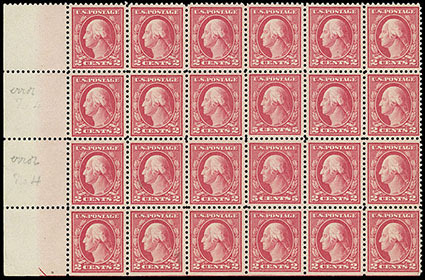 1917, 5¢ rose error, the double error in complete sheets of 100, o.g., error block never hinged (few stamps hinged well away from error block), rich color, strong intact perfs all around, F.-V.F., a scarce complete intact sheet. Scott No. 505 $1,850 for error block. 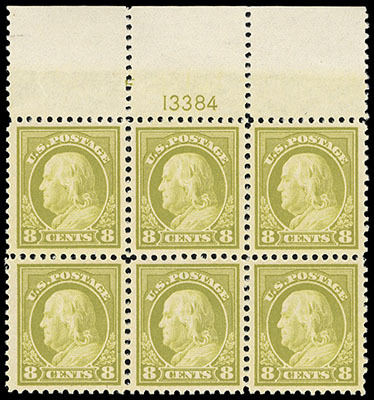 1917, 8¢ olive bister, top margin plate "13384" block of 6, o.g., never hinged, exceptional centering throughout, brilliant color, natural pre-printing paper fold in center stamps, Extremely Fine to Superb, a marvelous well centered plate block; with 2003 P.F. certificate. 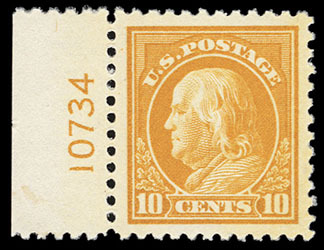 1917, 10¢ orange yellow, left margin plate "10734" number single, o.g., never hinged, virtually perfect centering within large evenly balanced margins, rich radiant color, an Extremely Fine to Superb jumbo, a marvelous gem plate single, ex-Whitman; with 2015 P.F. certificate Graded (XF-S 95J, SMQ $500). 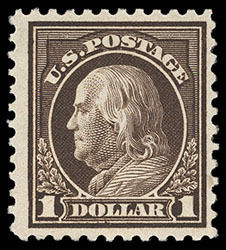 1917, 15¢ gray, top margin plate no. 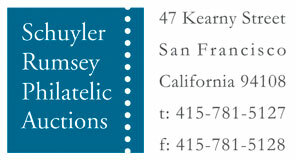 "13281" block of 6, o.g., never hinged, rich bold color, wide margins, fresh and Very Fine. 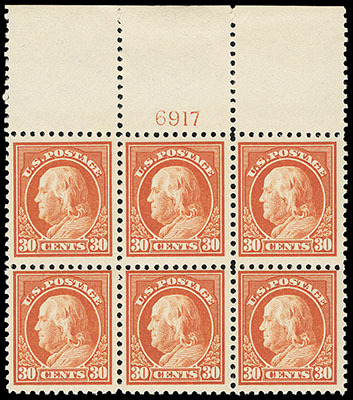 1917, 30¢ orange red, top margin plate no. 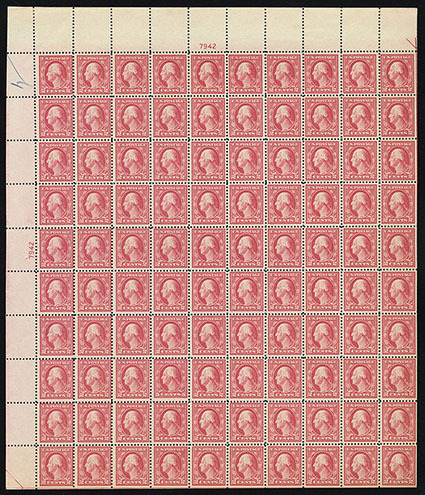 "6917" block of 6, o.g., stamps never hinged, hinged in ungummed selvage only, rich radiant color, F.-V.F. 1917, $1 violet brown, original gum never hinged, precise centering within lavishly large margins, beautiful shade, Superb; with 1999, 2007 P.S.E. certificates, the latter Graded (SUP 98J, SMQ$2,250). 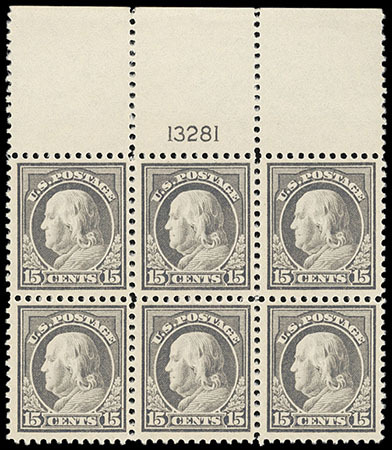 A VISUALLY STUNNING JUMBO EXAMPLE OF THE $1 1917 ISSUE, WITH ONLY FIVE OTHERS SHARING ITS PRESTIGIOUS GRADE AND WITH ONLY FOUR HIGHER (TWO 100 AND TWO 100J). 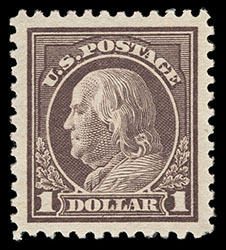 1917, $1 deep brown, o.g., never hinged, rich true deep brown shade, small natural fiber inclusion at lower right hardly detracting, F.-V.F., an attractive and rare never hinged example of this notoriously off-centered color variety; with 1991 and 2009 P.F. certificates. Scott No. 518b $4,000 for the grade of fine.